At Lord, I have cried we insert 4 Stichera, and sing the 3 Resurrection Stichera from the Oktoichos, doubling the 1st. Glory. Both now and the following Theotokion, the Dogmatic. O the great mystery! As I contemplate the wonders I proclaim the Godhead, I do not deny the humanity. For Emmanuel, as he loves humankind, opened the gates of nature, yet did not break open the locks of virginity, but came forth from the womb as he had entered through hearing. He became incarnate as he had been conceived. Impassibly he entered, ineffably he came forth, in accordance with the saying of the Prophet, ‘This gate will remain shut; none may enter through it, but only the Lord God of Israel, he who has great mercy’. Then O Joyful Light and the Prokeimenon The Lord is King with its verses. After Grant, Lord etc., we sing the first Resurrection Sticheron of the Aposticha and the following Prosomia of the Mother of God. Of all who are afflicted you are the joy, protector of the wronged, sustenance of those in need, staff of the blind, visitation of the sick, shelter and assistance of the oppressed, helper of orphans and Mother of God Most High, O All-pure. Hasten, we beseech you, to deliver your servants. Verse: Listen, daughter, and see, and incline your ear; and forget your people and your fathers’ house. Every iniquity without restraint, every sin without limit, wretch that I am, I have committed; of every condemnation I have become worthy. Grant me means of repentance, O Virgin, that I may appear there uncondemned. For I appoint you as my intercessor, I call you in as my protector. Do not put me to shame, O Bride of God. We have no other refuge to the Maker and Master but you, pure Bride of God. With your fervent protection do not cast us away; do not put us to shame who with love hasten under your shelter. Who will praise, who will call you blessed as is fitting, Maiden Bride of God, for the redemption which through you has come to the world? Therefore with thanksgiving we cry to you and say, ‘Hail, who made Adam divine and brought together what was separated. Hail, who enlightened our race by the light-bearing Resurrection of your Son and our God; for we, the race of Christians, unceasingly magnify you’. Christ has risen as usual, the Opening Psalm and the 1st Kathisma of the Psalter. At Lord, I have cried we insert 10 Stichera, and sing 3 of the Resurrection and 4 Anatolika. Come let us worship God the Word, begotten of the Father before the ages, incarnate of the Virgin Mary; for having endured the Cross, he was handed over for burial, as he himself wished, and having risen from the dead he saved me, mankind that had gone astray. Christ our Saviour by nailing the record against us to the Cross annulled it, and destroyed the might of death. We worship his Rising on the third day. With Archangels let us sing the praise of the Resurrection of Christ; for he is the Redeemer and the Saviour of our souls; and with dread glory and mighty power he is coming again to judge the world which he fashioned. An Angel proclaimed you, the crucified and buried Master, and said to the women, ‘Come, see where the Lord was lying. For he has risen as he said, as all-powerful’. Therefore we worship you, the only immortal. O Christ, Giver of life, have mercy on us. The gates of death opened to you Lord, in fear; Hells gate-keepers shuddered when they saw you; for you smashed the gates of brass, crushed to powder the iron bars, led us out of darkness and the shadow of death and tore our bonds asunder. Then 3 Idiomel Stichera of the Myrrhbearers. The Myrrhbearing women at deep dawn took spices and came to the Lords tomb. But finding what they had not hoped for, they began devoutly discussing the removal of the stone, and said to one another, ‘Where are the seals of the grave? Where is Pilates watch, and the strict security?’ But a dazzling Angel became the informer of the baffled women saying to them, ‘Why with lamentations do you seek the living, the one who gives life to the race of mortals? Christ our God has risen from the dead as all powerful, granting us incorruption and life, enlightenment and his great mercy’. The same tone. By Koumoulas. Why do you mingle sweet spices with your tears, O Women Disciples? The stone has been rolled away; the tomb has been emptied; see corruption trampled on by life, the seals clearly bearing witness, the guards of the unbelieving fast asleep. Mortality has been saved by the flesh of God. Hell is lamenting. Run with joy, say to the Apostles: Christ the first born from the dead has slain death and is going before you into Galilee. The Myrrhbearers rose at dawn and came to your tomb with haste. They were seeking you, O Christ, that they might anoint your spotless body, and instructed by the words of the Angel, they proclaimed the joyful signs to the Apostles, ‘The author of our salvation has risen, despoiling death but granting the world eternal life an d his great mercy’. Glory. Tone 6. By the Monk Kosmas. The Myrrhbearing women coming to your tomb and seeing the seals of the grave, but not finding your spotless Body, lamenting came with haste saying, ‘Who has stolen our hope? Who has taken a naked, embalmed corpse, the only consolation of his mother? Alas, how has he who brought the dead to life been put to death? How has he who despoiled Hell, been buried? But arise, O Saviour, of your own will on the third day, as you said, and save our souls’. At the Liti Idiomel Stichera. Tone 1. ‘Myrrhbearing women, why have you come to the tomb? Why do you seek the living among the dead? The Lord has risen, take courage!’ cries the Angel. With fear the women came to the grave, hastening to anoint the body with sweet spices, and not finding it they were at a loss among themselves, not knowing of the Resurrection. But an Angel came to them and said, ‘Christ has risen, granting us his great mercy’. Joseph asked for the Body of Jesus and laid it in his new grave: for he had to come from a tomb as from a bridal chamber. You have crushed the might of death and opened the gates of Paradise to mankind, glory to you. Both now. Theotokion. The same Tone. My Maker and Redeemer, Christ the Lord, coming from your womb, All pure one, having clothed himself in me, delivered Adam from the former curse. Therefore, All pure one, as truly Mother of God and Virgin, we cry to you unceasingly the Angel’s Hail, ‘Hail Sovereign Lady, protection and shelter and salvation of our souls’. At the Aposticha. Resurrection Sticheron. Tone 2. Your Resurrection, O Christ Saviour, has enlightened the whole inhabited world; and you have called back your own creation. All-powerful Lord, glory to you! Then the Paschal Stichera with their verses. Let God arise, and his enemies be scattered: and let those that hate him flee before his face. A sacred Pascha has been revealed to us today, a new and holy Pascha, a mystic Pascha, an all-venerable Pascha, a Pascha that is Christ the Redeemer, an unblemished Pascha, a great Pascha, a Pascha of the faithful, a Pascha that has opened for us the gates of Paradise, a Pascha that makes all the faithful holy. Come from that sight, you women, bearers of good tidings, and say to Sion, Receive from us the good tidings of joy, of Christs Resurrection. Exult, dance and be glad, Jerusalem, for you have seen Christ the King like a bridegroom coming from the grave. So shall the wicked perish at the presence of God; and let the just be glad. The myrrh-bearing women at deep dawn came to the grave of the giver of life. They found an Angel sitting on the stone, and he addressed them and said, ‘Why do you seek the living with the dead? Why do you mourn the incorruptible as though he were in corruption? Go, proclaim it to his Disciples’. The day of Resurrection; let us be radiant for the festival, and let us embrace one another. Let us say, brethren, even to those that hate us, ‘Let us forgive all things on the Resurrection’, and so let us cry, ‘Christ has risen from the dead: by death he has trampled on death, and to those in the graves given life’. When you went down to death, O immortal life, then you slew Hell with the lightning flash of your Godhead; but when from the depths below the earth you raised the dead, all the Powers in the heavens cried out: Giver of life, Christ our God, glory to you! The noble Joseph, taking down your most pure Body from the Tree, wrapped it in a clean shroud with sweet spices and laid it for burial in a new grave. But on the third day you arose, O Lord, granting the world your great mercy. The Angel standing by the grave cried to the women bearing myrrh, ‘Myrrh is fitting for the dead, but Christ has shown himself a stranger to corruption. But cry aloud: The Lord has risen, granting the world his great mercy’. After the first Psalter reading, Resurrection Kathismata. Tone 2. By not preventing the gravestone from being sealed and by rising again, you granted to all the rock of the faith. Lord, glory to you! Without emptying the most pure bosom in the highest, you accepted burial and resurrection on behalf of all. Lord, glory to you! Wholly beyond understanding, wholly glorious are your mysteries, Mother of God. sealed in purity and kept in virginity, you were known to be without deception a Mother who gave birth to the true God. Implore him that our souls may be saved. After the 2nd Psalter reading, other Kathismata. The Myrrhbearing women, having risen early and seen the grave empty, said to the Apostles, ‘The mighty one has destroyed corruption and snatched those in Hell from their bonds. Boldly proclaim that Christ God has risen, granting us his great mercy’. Bringing the spices for your burial, the women came secretly at dawn to the grave, fearing the harshness of the Jews, and foreseeing that the soldiers would protect it; but the weaker nature defeated manliness, for their loving intent was well-pleasing to God. Fittingly therefore they cried, ‘Arise, Lord, help us, and deliver us for your name’s sake’. You are highly glorified, Virgin Mother of God, and we sing your praise, for through the Cross of your Son Hell has been overthrown, death has died, we who were dead have risen and been granted life. We have received Paradise, our ancient delight. therefore with thanksgiving we glorify Christ our God as mighty and alone full of mercy. After Psalm 118, the Evlogitaria and the Ypakoο. Tone 2. The women coming to your grave after the Passion to anoint your body, Christ our God, saw Angels in the tomb and were amazed, for they heard from them the message, ‘The Lord has risen, granting the world his great mercy’. The Anavathmi of the tone. 1st Antiphon. I lift up the eyes of my heart to you in heaven, O Saviour. Save me by your radiance. Have mercy, O my Christ, on us who fail you hour by hour in many ways, and give us the means to turn back to you in repentance before the end. To the Holy Spirit belong kingship, sanctification and the guidance of creation; for he is God, consubstantial with the Father and the Word. If the Lord was not among us, who could be kept safe from the one who is both foe and murderer? Do not hand your servant over to their teeth, my Saviour. Like a lion they come against me, for they too are my foes. To the Holy Spirit belong the source of life and honour, for, being God, he gives all creatures power and watches over them together in the Father through the Son. Those who trust in the Lord are like the holy mountain; they are utterly unshaken by the assaults of Beliar. Let not those who live for God stretch out their hands in lawlessness; for with his rod Christ forbids his lot. By the Holy Spirit all wisdom flows forth, from which grace comes to the Apostles, the Martyrs are crowned for their struggles, and the Prophets see. Rise up, O Lord my God, according to the decree which you enjoined:* and an assembly of the peoples will surround you. Verse: O Lord my God, I have hoped in you. Save me from all who pursue me and deliver me. After Psalm 50, the Canons of Pascha with the Irmi to 4, of the Mother of God to 4 , and of the Myrrhbearers to 6 . Paschal Canon. Tone 1. Ode 1. The day of Resurrection, let us be radiant, O peoples. Pascha, the Lord’s Pascha! for Christ God has brought us from death to life, and from earth to heaven, as we sing the triumphal song. he boundary of death you forced open, all-pure Virgin, by bearing Christ the eternal Life, who shone out today from the tomb, and enlightened the world. Having seen your Son and God risen from the dead, rejoice with the Apostles, O holy and full of grace, and as cause of the joy of all, all-pure mother of God, you first received the greeting ‘Rejoice’. Canon of the Myrrhbearers. Tone 2. A Composition of Andrew of Crete. Ode 1. Irmos. You were crucified in the flesh, though impassible by the Father’s nature; you were pierced in the side and became a source of blood and water for the world. You are our God and we glorify you. I honour your Cross and glorify your burial, O Good One. I praise and worship your Rising, and I cry out, ‘You are our God and we glorify you’. Though you tasted gall, O sweetness of the Church, yet you poured out incorruption for us from your side. You are our God and we glorify you. You were numbered among the dead, O Saviour, when you raised the dead. You tasted corruption, for you knew nothing at all of destruction. You are our God and we glorify you. Let Zion rejoice, and let heaven be glad. Christ has risen and raised the dead who sing in praise, ‘You are our God and we glorify you’. In grave clothes Joseph wrapped your body, O Christ, and laid you, our salvation, in a new tomb; but as God you raised the dead. Anticipating the dawn, the women saw Christ and cried to God’s Disciples; ‘Christ has risen indeed. Come, and with us sing his praise’. All-holy Trinity, one Godhead, Unity without beginning: Father and Son and divine Spirit, save the world. You are our God and we glorify you. In your womb you abolished the ancient curse, holy Lady, and in giving birth to a babe you made the blessing flower for us; for he is God, though he bears flesh. Yesterday I was buried with you O Christ, today I rise with you as you arise: yesterday I was crucified with you, glorify me with you, Saviour, in your Kingdom. oly one, today I return to life undefiled, through the goodness of the One born from you and whose brightness shines to all the ends of the earth. Seeing God, whom your conceived in the flesh, rising from the dead as he said, dance pure Maiden, and magnify him as God, O Immaculate. When you nailed your palms to the Cross, O Jesu, and gathered in all the nations from error, you invited them to knowledge of you, O Saviour. The Jewish people cried out to Pilate, ‘Release for me the wicked thief. As for the Sinless One, away with him, away with him, crucify him’. When you were crucified, O Christ, the light grew dark, the earth was shaken and many dead rose from the tomb through fear of your might. I worship your Cross, I praise your Burial, I honour your sufferings, O Jesu, the nails in your hands, the lance and the Resurrection. You arose, O Jesu; the enemy was despoiled, Adam, and Eve with him, was delivered from bonds and corruption by your Resurrection. When you arose, O Christ, the bars and gates of Hell were smashed, and the bonds of death immediately untied, through fear of your might. Let the twelve Disciples rejoice with us, with the Myrrhbearing women, with Joseph and Christ’s other Disciples, men and women. With the Father I worship and praise the Son and the right Spirit, the one Nature, separating the Persons and uniting the Essence. Blessed are you, holy Lady from the root of Jesse. From you according to the flesh sprang Christ, the rod and the flower, for our sake. The choir of your disciples rejoices in harmony with the Myrrhbearing women, for they celebrate a common feast with them, to the glory and honour of your Resurrection, and through them we cry to you, ‘O Lord, who love mankind, grant to your people your great mercy’. Let the Prophet Avvakum, inspired by God, keep the divine watch with us, and show forth the radiant Angel, who with resounding voice declares, ‘Today brings salvation to the world, for Christ has risen as omnipotent’. Christ appeared as a ‘male’ who opened a virgin womb; but as our food he is called ‘lamb’; ‘unblemished’, as our Passover without stain; and ‘perfect’ for he is true God. As a yearling lamb, for us the blessed crown, Christ was willingly sacrificed for all, a cleansing Passover; and from the tomb the fair sun of justice has shone for us again. God’s forebear David dancing leaped before the Ark, mere shadow; but seeing the fulfilment of the types, let us, God’s holy people, inspired, rejoice, for Christ is risen as omnipotent. ven he who fashioned Adam your forefather, O holy one, is fashioned from you, and by his own death he has today destroyed the death that came through him, and shed light on all with the divine beams of his Resurrection. Seeing Christ, whom you bore, shining in beauty from the dead, O Pure One, fair and lovely, and spotless among women, as you rejoice to-day with the Apostles at the salvation of all, glorify him. Of the Myrrhbearers. The Irmos. Through a Cross you took prisoner the belly of Hell, you raised the dead with you and overthrew the tyranny of death. Therefore we, Adam’s descendants, falling down in worship sing the praise of your burial and your Rising, O Christ. You were well pleased, our Saviour, through the bowels of your mercy, to be nailed to the Cross, and to redeem us from the ancestral curse. Release me from the bonds of my many offences, for you can accomplish whatever you will. Having nailed my ancient curse on the Cross, O Saviour, and become a source of blessing for me through the blood from your side, release me from the bonds of my many offences, for you can accomplish whatever you will. When Hell met you in the infernal regions, O Saviour, he was embittered, seeing that the dead, whom he of old had had the strength to swallow, now, unwilling, he was giving back. The depths below are being scoured, laid bare and despoiled of the dead. Though the stone was sealed, O lawless foes, and the watch set, yet the Lord arose as he foretold, releasing the bonds of my many offences, for he can accomplish whatever he wills. Having risen from the dead, despoiled Hell, given life to the dead and become for me a source of incorruption by your Rising, release the bonds of my many offences, for you can accomplish whatever you will. Be ashamed indeed, lawless ones, for Christ has risen and raised the dead with him, crying, ‘Be of good courage. I have conquered the world’. Obey him then, or keep silence, misguided ones, who deny his Resurrection. Having risen from the tomb, O Good One, you greeted the Myrrhbearers with the cry, ‘Rejoice’, and commanded the Apostles, ‘Proclaim my Rising’; release the bonds of my many offences, for you can accomplish whatever you will. Let us honour the noble Joseph, zealot for true religion, counsellor and disciple, with the Myrrhbearers and the Apostles, as we cry out with them, and with faith and gladness praise the Saviour’s Resurrection. Who can declare the indivisible glory of the Godhead beyond all being? For a Trinity in nature is praised, without beginning, identical in nature, praised as a Unity in Trinity, with simple substances. Holy Virgin-mother, unceasingly implore the One who dwelt in your womb, whom you bore without pangs, to release me from the bonds of my many offences, for you can help whatever you will. Let us arise in the early dawn, and instead of myrrh, offer praises to the Master, and we shall see Christ, the Sun of Righteousness, who causes life to dawn for all. Those who were held by the chains of Hell, seeing your measureless compassion, press forward to the light, O Christ, with joyful step, praising an eternal Passover. With torches in our hands let us go forth to meet Christ as he comes from the grave like a bridegroom, and with the festive ranks of Angels let us feast God’s saving Passover. immaculate Mother of God, the assembly of the devout is enlightened by the divine and life-giving rays of your Son’s resurrection, and is filled with joy. You did not open the gates of the Virgin, when you took flesh. You did not break the seals of the sepulchre, O King of creation. Therefore when she saw you risen, she rejoiced. The ancient garment, which the sower of sin wove for me, alas, you stripped off me, my Saviour, when you clothed yourself in me. My sin sewed fig leaves for me when I, alas, by the counsel of the serpent did not keep your most pure commandment, my Saviour. Coming upon my soul wounded by my thieving thoughts, Christ, the child of Mary, poured oil on it and healed it. Standing by the Cross the blameless Mother of God called out as a mother, ‘You have left me behind alone, my Son and my God’. Having overthrown the serpent, origin of evil, with the weapon of your Cross, you smashed the sting of death, O Jesu. ‘Where death is your sting? Where Hell your victory?’ Let Adam join the cry. You have been smashed by the return to life of him who raised the dead. As we celebrate the memory of the devout Myrrhbearers and of all your Disciples, in your shining Rising, we sing your praise, O Christ. Let us all worthily honour the noble one who took down the Lord’s body from the tree and faithfully gave it burial. I worship God, Father and Son and Spirit, three Persons, and I believe the one to be three with one Essence. We faithful praise you, who gave birth by a conception beyond nature without seed to him who renews nature, Christ, the only Master. Katavasia. Let us rise at dawn. You went down to the deepest parts of the earth, and you shattered the everlasting bars that held fast those that were fettered, O Christ. And on the third day, like Jonas from the whale, you arose from the tomb. O my Saviour, the living, unslain Victim, as God offering yourself willingly to the Father, you raised with yourself all Adam’s race in rising from the tomb. risoner of old of death and corruption, the human race has been brought back through him was took flesh from your spotless womb to incorruptible and everlasting life, O Virgin Mother of God. He who went down into your womb, O pure Maiden, dwelt there and took flesh beyond understanding, went down into the lowest parts of the earth and raised Adam with himself when he rose from the tomb. Hell is dead. Take courage, you who are born of earth, for Christ, hung upon the tree, has hurled away the sword against him and Hell lies dead. For, stripped naked, he has been despoiled of those he held. ‘Hell has been despoiled! Take courage you dead! The graves have been opened, arise!’ Christ, who came to ransom all mankind from death and corruption, cries out to you from Hell. ‘Now, Hell, you have orders. Give me back the dead you once had strength to swallow’, the Life-giver and God, who came to ransom all mankind from your insatiable maw, cries out to you. The Lord has risen, having despoiled the foe and delivered the prisoners. He has brought back all mankind and raised Adam the first-formed, for he is compassionate and loves mankind. Having wrapped you in a winding sheet, O Christ, the noble Joseph laid you in a grave. having anointed the temple of your body which had been destroyed, he rolled a great stone to the mouth of the sepulchre. O Myrrh-bearing women, why do you still hurry? Why do you bring spices for the living? Christ has risen as he foretold. Let your tears cease: they have changed to joy. Let us believers praise the Trinity in Unity, glorifying the Father with the Son, and the Spirit consubstantial with the Son, and him who with the Father is without beginning and eternal God. Like a vine, pure Maiden, you conceived unhusbanded in your womb the Grape Cluster of incorruption, from which for us the streams of immortality pour out, like wine, eternal life. Kontakion. Model Melody. Tone 2. When you cried to the Myrrhbearers, ‘Rejoice!’, Christ our God, you ended the lament of our foremother Eve by your resurrection, while you ordered your Apostles to proclaim, ‘The Saviour has risen from the grave’. As they went to your tomb, O Saviour, the Myrrhbearers were troubled among themselves in mind and they said, ‘Who will roll away the stone from the grave for us?’ And looking up they see that the stone has been rolled away. They were amazed by the appearance of the Angel and his raiment; they were seized with fright and thought to flee; but the young man cried out to them, ‘Do not be afraid. The one you seek has risen. Come, see the place where the body of Jesus was laid and going quickly tell his disciples: The Saviour has risen from the grave’. 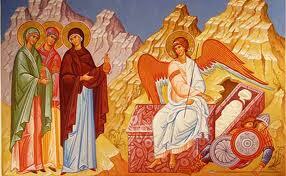 On the same day, the third Sunday from Pascha, we celebrate the feast of the Myrrhbearers. We also remember Joseph of Arimatheia, who was a disciple in secret, as well as Nikodemos, the disciple by night. While I to them, like spices, bring my hymn. He who delivered the Children from the furnace, becoming man suffers as a mortal, and through suffering he clothes the mortal with the glory of incorruption: the only blessed and most glorious God of our fathers. aving slain death, your Son today, All-blameless one, has given to all mortals life that endures to ages of ages, he the only blessed and highly exalted God of our fathers. He who reigns over all creation, becoming man, dwelt in your womb, O full of God’s grace, and having endured Cross and death, he has risen as God and raised us with him, for he is all powerful. Wishing, as you love mankind, to save from error all those you had fashioned, you endured being nailed to the Cross, that in your flesh, O Saviour, you might renew the image smothered by the passions; and having overthrown Hell you raised up the dead with yourself. Lifted up on the cross, O Merciful, you called all to yourself, as you had promised, O Good One; for you were well-pleased in truth to suffer all these things because of our sins; so too you opened the gates of Paradise to the thief, O Saviour. The temple of your body, which had been destroyed, you raised on the third day, as you had promised, O Good One, that in truth you might make known your glory, which you pour out upon us through the faith, having freed the prisoners whom Hell of old held captive. O the madness of the Jews! O the frenzy of the lawless! What had you seen which was unbelievable, that you did not believe Christ? That he did not raise the sick with a word? That he did not save the whole world himself? If not the soldiers, then let those risen from the dead convince you. Let the guards, who became as dead men, now say how he was stolen, whom they did not see, being wholly without sensation. For if they did not see, did not perceive him risen, how then could they ever think he had been stolen? Let them convince you, and also this stone and Christ’s grave clothes. Why do you guard him like a corpse? Why have you set seals on the stone, O Jews? Fearing theft? See, the tomb was truly sealed. How then did Christ arise unless he was God? Let those who arose and were seen by many persuade you. With the Father we glorify the Son and the Holy Spirit, crying out with unceasing voice, ‘Trinity, single Essence, have mercy. Save us all, Unity in three Persons. Have pity, O God, glorified to the ages’. How did you contain as a child in your womb, O Immaculate, him before whom as God the angelic powers tremble? Unless as he willed, as he knew how, he took up his dwelling, wishing to save the those born from earth, Adam’s seed, by freeing Adam from that curse which came through the bitter eating. Lift your eyes around you, O Sion, and see: for behold like beacons shedding light divine your children have come to you, from West and North, from the Sea and from the East, blessing Christ in you to all the ages. Almighty Father, Word and Spirit, nature united in three Persons, beyond all being and beyond all Godhead, into you we have been baptised and we bless you to all the ages. s the Creator came into the world through you, Virgin Mother of God, tearing open the belly of Hell, he granted us mortals the Resurrection; therefore we bless him to the ages. Your Son, O Virgin, having overthrown the might of death by his resurrection, as a mighty God has exalted us with himself and made us divine; therefore we praise him to the ages. The rays of the sun cowered with fear at the sufferings of Christ, the dead were raised, the mountains were shaken, the earth quaked and Hell was stripped bare. The thrice-blessed Youths in the furnace of old raised their hands, typifying your most pure Cross, through which, O Christ, you overthrew the power of the foe. O blind Jews, deceivers and transgressors, who do not trust Christ’s Resurrection, as though it was a lie, what do you see that you cannot believe? That Christ has risen, he who raised the dead? O hostile Jews, even though you do not believe us, ask your own soldiers what they experienced. Who with their hands rolled the stone away from the grave? Who withered the fig-tree? Who healed the withered hand? Who once fed the multitudes in the desert? If not Christ God, who raised the dead. Who gave light to the blind, healed lepers, cured the lame and walked on the sea dry-shod as though on land? If not Christ God, who raised the dead. Who raised from the tomb one four days dead, and the widow’s son? Who gave strength to the paralytic on his bed? If not Christ God, who raised the dead. The stone itself cries out, the seals, which you placed yourselves when you posted the sentries to guard the grave, shout aloud, ‘Christ has risen indeed, and lives to the ages’. Christ has risen indeed, Hell is despoiled, the serpent slain, Adam redeemed, those below are saved. Why do you persist in unbelief, foes and transgressors? With the Father we glorify the Son and the Holy Spirit, the holy Trinity in one Godhead, as we cry, ‘Holy, Holy, Holy are you to the ages’. In your womb, pure Maiden, you bore without change the ever-living bread, compounded uncompoundedly with our composition, one Christ, God, in the two Essences. Shine, shine, O New Jerusalem, for the glory of the Lord has risen upon you; dance now and be glad, O Sion, and you too rejoice, O pure Mother of God, at the arising of him to whom you gave birth. ow in harmony, O Virgin, we faithful call you blessed. Hail, gate of the Lord! Hail, living city! Hail, through whom today the light of the Resurrection from the dead of him who was born from you has shone for us! Rejoice, be glad, divine Gate of the Light; for Jesus who set in the tomb has dawned, shining more brightly than the sun, and shedding his rays on all the faithful, O Sovereign Lady, full of God’s grace. The thief who acknowledged you on the Cross as God, All-powerful Saviour, you made heir to the spiritual Paradise when he cried, ‘Remember’. You were struck, you were spat upon by the lawless for our sake, O Jesu, who traced the tables of the law on Sinai for your servant Moses. You were given vinegar and gall to drink for our sake, O Saviour, who give us your Body and your precious Blood as the food and drink of your eternal life. When your life-giving side was pierced by the lance, O Christ, you poured out your immaculate Blood and precious Water as an ever-living spring for the world. You, who brought the dead to life, were numbered among the dead. You, who emptied the tombs, were laid in a tomb. You despoiled Hell in raising Adam. You arose, O Jesu. The foe was bound, Hell despoiled, tombs stripped bare, those below raised, as they worshipped you, O Christ. Who stole the dead body? And moreover naked? Why are you deceived, O Jews? Christ has risen and the bonds and bars of hell have been unloosed. Glory to you, Christ Saviour, who poured out life, made light dawn for those in the darkness of ignorance, and shone over all the earth by your Rising. Let the noble counsellor Joseph be praised with the Myrrhbearers and the godly Disciples, as he too is a herald of Christ’s Rising. You are without beginning, O Father; you are uncreated, O Son; you are equal in rank, O Holy Spirit; the three one in nature and three in persons, one true God. Let Jesse rejoice and David dance, for see, the Virgin, the stem of God’s planting, has blossomed with the flower, Christ the ever-living. Holy is the Lord our God [x3]. Exapostilarion of Pascha. Tone 2. Having fallen asleep in the flesh as one mortal, O King and Lord, you rose again on the third day, raising up Adam from corruption, and abolishing death. Pascha of incorruption; salvation of the world. Another, of the Myrrhbearers. Model Melody. Women hear a voice of gladness, ‘Trampling on the tyrant Hell, I have raised the world from corruption. Run, tell my friends the good tidings, for I wish joy to shine on what I fashioned from the source from which came grief’. At Lauds we insert 8 stichera, 4 of the Resurrection and 4 of Anatolios. 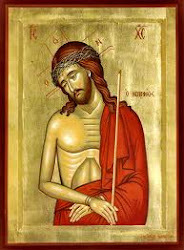 Let everything that has breath and every creature glorify you, O Lord, for through the Cross you have abolished death, that you might show the peoples your Resurrection from the dead, as you alone love mankind. Let the Jews say how the soldiers lost the king they were guarding. For why did the stone not guard the Rock of life? Let them hand over the buried one, or worship the Risen One, saying with us: Glory to the multitude of your mercies, our Saviour, glory to you. Rejoice you peoples and be glad. The Angel sat on the stone of the grave: he brought you the good news, saying: Christ has risen from the dead, the Saviour of the world, and filled the universe with fragrance. Rejoice you peoples and be glad. Let nations and peoples praise Christ our God, who willingly endured the Cross for us and spent three days in hell; and let them worship his Resurrection from the dead, through which all the ends of the world have been filled with light. You were crucified, you were buried, O Christ, as you willed; you despoiled death as God and Master, granting the world eternal life and your great mercy. In truth, lawless ones, by sealing the tomb you have granted us a greater marvel; the guards have the knowledge; today he came from the grave, and they said: You said that while we slept the Disciples came and stole him. And who steals a corpse, especially one that is naked? But he has risen by his own authority as God, leaving behind his grave-clothes in the tomb. Come, O Jews, see how he did not burst the seals the One who trampled on death and grants the human race life without end and his great mercy. Glory. Eothinon 4. Tone 4. It was early dawn and the women came to your grave, O Christ, but the body which they longed for was not found; therefore they were much perplexed. Then those in dazzling garments came to them and said, ‘Why do you seek the living with the dead? He has risen as he foretold. Why have you forgotten his words?’ Convinced by this they proclaimed what they had seen. But the good tidings seemed an idle tale, so dull were the disciples still. But Peter ran, and having seen, glorified your wonders to himself. Αναρτήθηκε από amphilochios στις 12:58 μ.μ.